« Simple Sauerkraut Recipe – Just in Time for Oktoberfest! A little more than a year ago we taught you how to cook hot wings, and they were delicious. After spending a solid chunk of this past Sunday watching football at a restaurant that *gasp* did not serve wings, I was left with a serious crunchy, saucy chicken craving. I was thinking about wings so hard that I’m shocked I didn’t sprout a pair of my own. Naturally, after the game I dug up the recipe from last year, but then I thought “how do you make hot wings a little differently?” The answer? I turned to a favorite restaurant for inspiration and came away with some sweet, spicy, seriously flavorful Korean-style baked chicken wings. They’re definitely going on the Sunday Football food menu. Ready? It’s a shockingly simple recipe. These are oven baked chicken wings, but you can also grill them or even fry the chicken wings, then toss them in the addictively sweet-spicy sauce. You can even make these ahead of time and reheat them before serving if you’re trying to save time on game day. In a saucepan, combine the oil, minced garlic, minced ginger, jam, chile paste and soy sauce. Pour 1/3 of the sauce into a large bowl. Add the chicken wings, tossing to combine. Spread the wings on a foil-lined baking tray, extra sauce and all. Bake for 12-15 minutes, then turn over, brush with some (but not all) of the additional sauce, and bake for another 12-15 minutes. Remove from oven, toss the chicken wings in about half the remaining sauce, and return to sheet tray. When one side is done to your liking, flip and broil the other side of your chicken wings. Remove from oven, toss in remaining sauce and arrange on a plate. Sprinkle with sesame seeds, peanuts, and green onions as a flavorful garnish. Just check out that closeup. 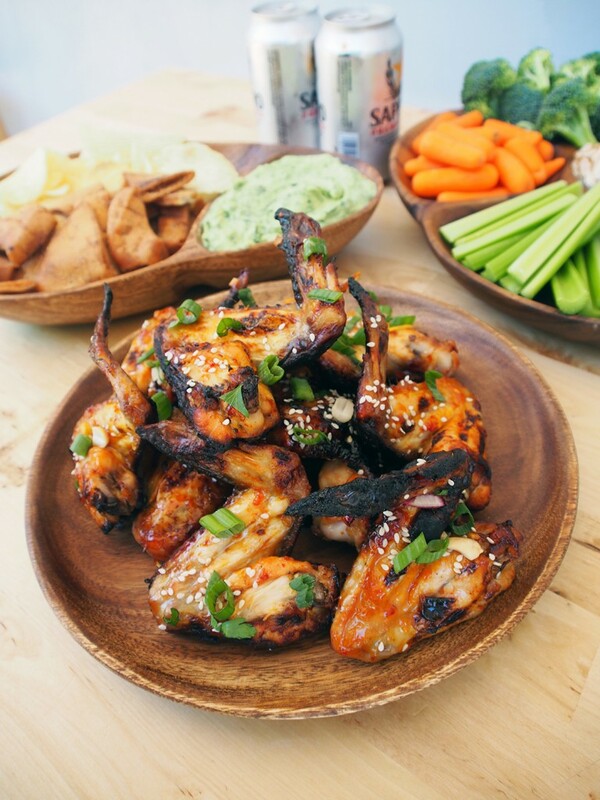 Clearly, these are some delicious baked chicken wings. 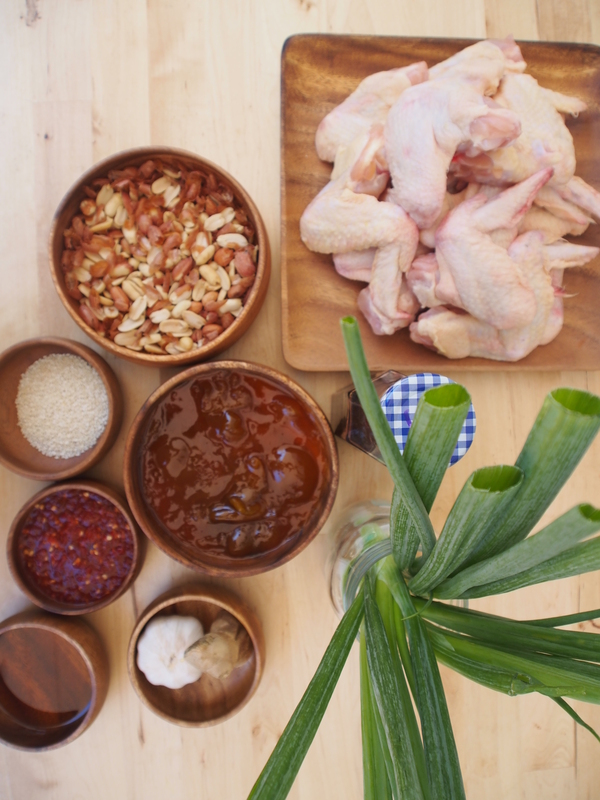 Sure, there are a few steps involved in making these Asian chicken wings, but the process goes quickly and the end results are SO delicious. 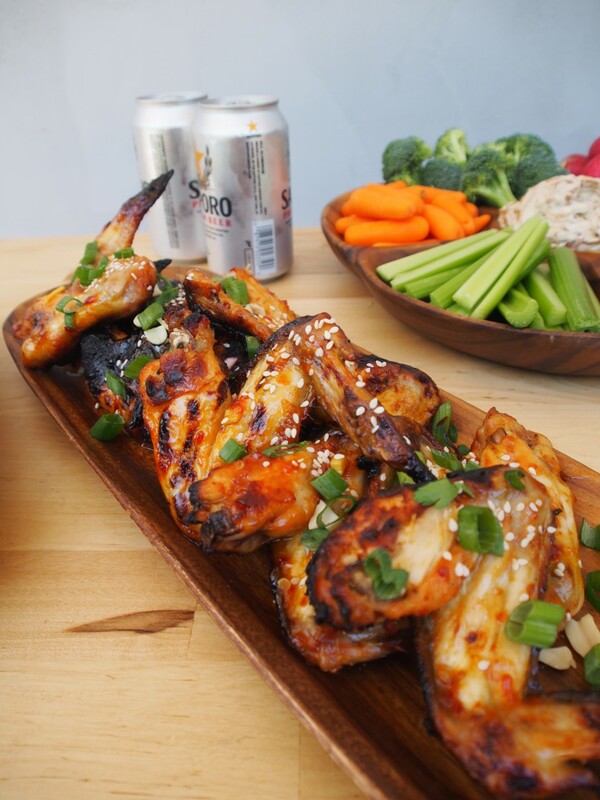 If you’re not sure what to serve with chicken wings, you could go with a traditional football food spread of chips, dips and beer, or you can try to keep everything in theme – pair these with some Korean BBQ tacos, kimchi and rice for a satisfying, delicious, totally unexpected touchdown of a meal. Check back next week for more football food – some of our absolute favorite dips for veggies or chips. 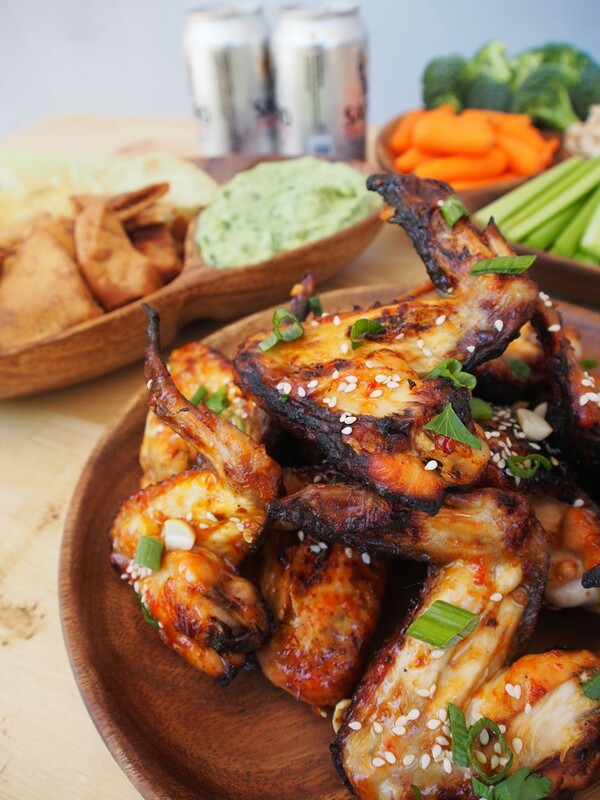 Spoiler alert: they’re almost as addictive as these wings. This entry was posted on Thursday, September 11th, 2014 at 5:00 pm and is filed under Acaciaware, Entertaining, General, Recipes. You can follow any responses to this entry through the RSS 2.0 feed. Both comments and pings are currently closed.